Across the United States, hundreds of thousands of human embryos exist frozen in liquid nitrogen, having been created for in-vitro fertilization but never having been implanted. And, according to a recent poll, almost 50% of Americans believe that life begins at conception—meaning that, in the hearts and minds of many prospective parents, these embryos are not only potential for life; they are life, in need of families. Local mom Melanie Sams is one of these believers. Melanie, a professional in the world of banking, didn’t want to be a young mother. Through her twenties and thirties, she waited for the right time to have children; she knew she wanted to be a parent, but she never found herself in the conventionally acceptable position (marriage) to pursue parenthood. When she entered her forties as a single woman, she decided to wait no longer: she began looking into non-traditional ways of becoming a mother. Adoption was an option, but it proved difficult; Melanie found that most biological parents were looking for couples, not singles, to adopt their children. So she decided to take another route: at 41, she consulted a fertility specialist, with the intention to grow, birth, and love an embryo created by another family. The process of accepting an embryo donation was not simple. Melanie underwent physical and psychological testing, as well as preparatory surgery, to ensure that she would be able to provide a suitable in-utero home for the microscopic being. Melanie twice underwent IVF with donated embryos. The first round resulted in pregnancy with twins, but she experienced a miscarriage. The second attempt also saw the implantation of two embryos, but only one was viable. Melanie spent the majority of her pregnancy terrified that she would miscarry again. Even at eight months, she was still speaking about the birth hypothetically: “If this all works out, then . . .” She didn’t purchase any baby supplies until one week before her scheduled C-section because she was so afraid she would lose the baby. But these fears proved to be unwarranted, and on September 21, 2012, Piper was born: a healthy, eight-pound baby girl, to a head-over-heels 43-year-old mother. Melanie immediately felt the desire to share the arrival of Piper with Piper’s biological parents, but because the donation was “closed,” contact with her donors is unavailable. As a longtime DFW resident, Melanie raised Piper for her first two years in McKinney, Texas. She benefited from a private caregiver and Montessori education. But in 2015, when Melanie took a position with Bank of America that allowed her to work remotely, she moved home to Texarkana to be near family. 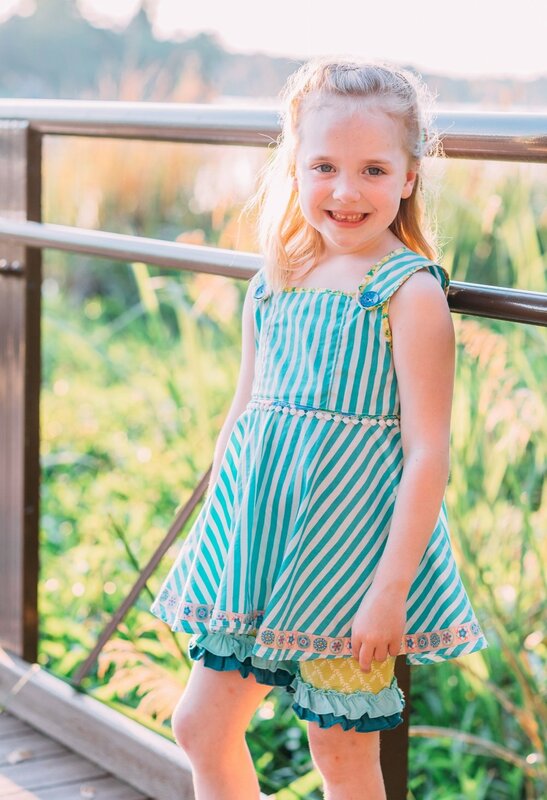 Piper currently attends school at St. James Day School and participates in dance, piano lessons, gymnastics, soccer, and T-ball. She loves having “cousin sleepover parties” with the children of Melanie’s four siblings. She has an outgoing, vivacious personality. “I am always amazed by her ability to make conversation with strangers, and how she carries herself so confidently,” Melanie said. ^ While on a family vacation in 2016, Melanie and Piper visited Blue Mountain Beach in Florida.